Model organisms, brought into labs because they are easy to work with, adapt to the lab, often shedding characteristics that allowed them to survive in the wild. Scientists who work with model organisms rarely look at the wild strains, but when they do, they can be surprised by what they find. This is what happened with the soil-living social amoeba, Dictyostelium discoideum, or Dicty. The single-celled amoebas crawl through the soil eating bacteria until food becomes scarce. Then the amoebas gather by the tens of thousands to form a multicellular slug, which transforms itself into a fruiting body: a sterile stalk that holds aloft a sorus, a tiny sphere that releases spores that become single amoebae again. Isolated from decaying leaves collected in a hardwood forest in North Carolina in the summer of 1933, Dicty have been used for years to study development and, more recently, conflict and cooperation. 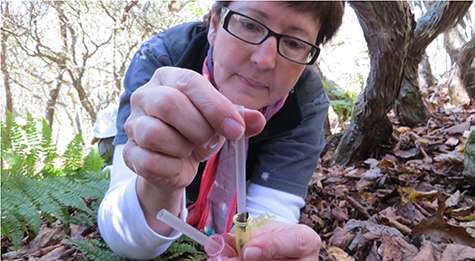 Over the years, the model organism had adapted to growing in shaking flasks of liquid, a far cry from the soil, which Washington University in St. Louis biologist Joan Strassmann characterizes as "a noxious and terrifying environment for the little things that live there." In 1998, David Queller and Strassmann, both then on the faculty of Rice University in Houston, began isolating and working with wild clones of Dicty from soil collected at a field station in Virginia and various other locations around the U.S. When these clones were examined closely, they revealed a whole new world. All Dicty eat bacteria, but some clones (genetically identical amoebas) also farm them—or at any rate, they gather up the bacteria, carry them to new sites and harvest them prudently. The farmer clones also carry bacteria that secrete chemicals to fend off amoebae that don't bother to do their own farming. Not only do these defensive companions inhibit the growth of nonfarmers, they somehow stimulate the growth of the farmers. The scientists, who have since moved to Washington University in St. Louis, describe this miniature ecosystem and its players in the Sept. 13, 2013, online edition of Nature Communications. "Our results suggest that successful farming is a complex evolutionary adaptation because it requires additional strategies, such as recruiting third parties, to effectively defend and privatize the crops," the scientists wrote. "A lot of work has been done on this organism," said Debra Brock, a research scientist in the Queller/Strassmann lab. "But the model organism is descended from a wild clone that was probably a nonfarmer. "I had worked for years with the axenic clone (the model organism adapted to grow in liquid) when I joined the Queller/Strassmann lab as a graduate student. They had a large collection of wild discoideum clones, which I had never studied. "When I looked at these clones under the microscope, I saw that some of them carried bacteria in their sorae, which were supposed to be sterile. 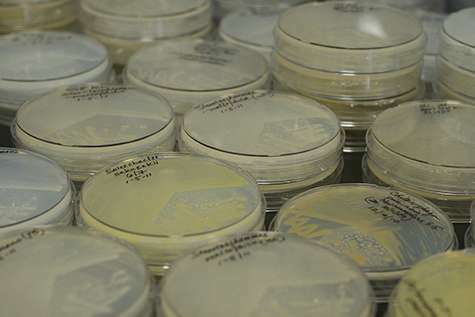 A simple assay confirmed that the sorae from these clones seeded new patches of bacterial growth while those from clones that did not have bacteria did not." It looked like the amoebas were carrying the bacteria around to make sure they would always have food. But other scientists weren't convinced. After all, the amoebas are grown on bacteria in the lab; perhaps they had just picked up these bacteria by accident. "At first it was an uphill battle," Brock said. But by isolating new clones from the wild that also carried edible bacteria in their sorae and running the clones through assays that showed, for example, that farmers cleansed of bacteria would pick them up again, the scientists eventually made their case. As the researchers said in a Nature paper published in 2011, about a third of the wild clones carry, seed and prudently harvest edible bacteria, qualifying as farmers, albeit primitive ones. But the situation was actually more complex than this. Brock quickly realized that some of the bacteria found in association with the Dicty weren't edible. "I was sending the bacterial DNA out to be sequenced and looking up the sequence when it came back. Sometimes the bacteria were similar to human pathogens. "Again it wasn't clear what was going on," Brock said. "Were these bacteria parasites on the amoebas? Were they free riders the amoebas picked up accidentally when they picked up the food bacteria? Were they pathogens that were making the amoebas sick? " But the amoebas carrying these bacteria seemed to be thriving rather than sick. And she also knew that in other systems, farmers carry defensive symbionts. Leafcutter ants, for example, carry bacteria that help prevent other fungi from contaminating their fungal gardens. Could the inedible bacteria on the Dicty be defensive symbionts? Sure enough, assays showed that when farmers carried certain nonedible strains, nonfarmer spore production was reduced, in some cases by more than half. Supernatants (washings) from bacterial cultures had similar effects, suggesting that the bacteria were secreting biomolecules that poisoned nonfarmers, preventing them from eating the farmers' crops. But that wasn't the end of the surprises. The defensive symbionts don't just squash nonfarmers, they seem also to help the farmers thrive. Brock suspects the amoebas and the bacteria are cross feeding. "They're probably providing something for those bacteria and the bacteria are providing something for them. I'm currently trying to figure that out," she said. Does it pay to farm? The big question for the team, all evolutionary biologists, was why is farming evolutionarily stable among Dicty? Why does this adaptation persist and, conversely why doesn't it take over the entire population? The answer is that the value of farming as a strategy depends on the circumstances. Farming, by itself, does not confer a selection advantage on the Dicty clones. If food is abundant, nonfarmers alone produce more spores than farmers alone. The reason is that farming is costly. Farmers save roughly half the bacteria available to them, forgoing considerable food to save some for dispersal at a new site. Like human farmers, they try never to touch their "seed corn." The tables are turned, however, if food is scarce—if the amoebas are dispersed to a site without a good source—farmers produce more spores than nonfarmers because they are able to make their new site productive. What happens when farmers and nonfarmers are in direct competition? The farmers produce a valuable crop that could be eaten by nonfarmer clones that do not pay the costs of farming, making farming a losing strategy again. That's where the defensive symbionts come in. In the Nature Communications' article, the scientists describe assays where they mixed farmers and nonfarmers in different proportions to see how they would do in direct competition with one another. As the percentage of farmers in the mix increased, nonfarmers produced far fewer spores, and the spore production of farmers was unchanged. These results suggest that social amoebas make farming pay much as human farmers all over the world have done, by privatizing their crops. Without the benefit of human institutions that guarantee property rights or a just division of goods, they enforce their rights through chemical warfare. 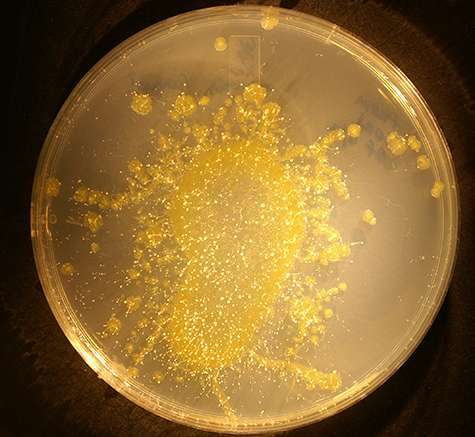 "This is a neat example that shows that when you start looking at the natural history of things, even microbes, which people don't study very much, you discover that amazing things are going on," Queller said. "It's also about being open-minded," Strassmann said. "When you see things that don't quite fit the standard story, a good scientist will not try to jam them into the story, but instead recognize something different is going on and try to figure it out."